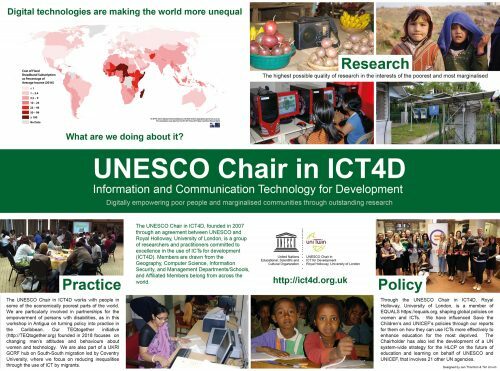 The UNESCO Chair in ICT4D is passionate about partnerships, not only through its research about them, but also through their practical importance in delivering effective empowerment for poor people through ICTs. Over the years, the group has worked with many partners both for research purposes and also in practice, and details of these are listed towards the end of this page. ICT4D Conference, Zambia, 2017 content partner, co-leading on education stream. Jigsaw Consult – especially working together on monitoring and evaluating the use of ICTs in education. UNESCO – as the UNESCO Chair in ICT4D, we work closely with the Communications and Information Sector of UNESCO, as for example through helping them develop a new award for the use of ICTs in empowering people with disabilities. Unwin, T. (2015) Multi-Stakeholder Partnerships in Information and Communication for Development Interventions, in International Encyclopedia of Digital Communication and Society, Chichester: Wiley, 1-10. Unwin, T. (2012) Effective partnerships for development, Commonwealth Ministers Reference Book 2012, London: Henley Media Group in association with the Commonwealth Secretariat, 127-129. Unwin, T. and Wong, A. (2012) Global Education Initiative: Retrospective on Partnerships for Education Development 2003-2011, Geneva: World Economic Forum, 2012, 60 pp. Geldof, M., Grimshaw, D.J., Kleine, D. and Unwin, T. (2011) What are the key lessons of ICT4D partnerships for poverty reduction? Systematic Review Report for DFID. The ICT4D Collective helped InWEnt to deliver its fourth e-Learning seminar in Bonn from 4th-5th November 2004. Co-hosting of a pre-conference workshop on the benefits of OER for capacity development in Africa at Online Educa Berlin in 2008, with presentations by Philipp Schmidt, Leonard Mware Oloo and Jorrit Mulder, and workshop discussions led by Günther Osswald, Philip Schmidt, Fred de Vries and Frank Banks (workshop conclusions). The Collective, together with the Swiss Agency for Development and Cooperation, the Global Knowledge Partnership, SPIDER and Wilton Park (an academically independent Executive Agency of the British Foreign & Commonwealth Office) convened a conference on “Becoming an Information Society: the Role of New Information Technologies in Development” at Wilton Park from 17th-20th October 2005. Workshop on ICT partnerships at Wilton Park and British Council conference on “Higher Education for Development: Challenges, Strategies and Policies” 27th-31st March 2006. Collaborative research in geography and land management. Professor Joseph Salkvadze served on PhD supevisory panel. Project funded by The British Academy to help enhance research and teaching in Human Geography in Georgia. Report completed by Tim Unwin in June 2005. Cisco provided an internship during the summer of 2005 for a student completing the ICT4D course at Royal Holloway, University of London.